Local villagers usually brings cattle offerings to the ancient well just outside the village. A dragon is said to inhabit the well. Feeding the dragon ensures that he will not raid the countryside. Lately the dragon in the well has become more demanding, requesting gold and treasure too. Investigation is mandatory now. Grab a dungeon, add your favorite RPG system and go! Each 0one’s Page Dungeon features one dungeon, map and description, contained in one single page. The description is a complete adventure you can play as is (adding statblocks) or expand as you wish. Of course, being the whole adventure contained in half a page can’t be exhaustive, so only main guidelines are given. These dungeons make perfect side treks as they are, and can become fully fleshed-out adventures with a little bit of work. For each dungeon you get a color page, a print-friendly page, and a page containing only the dungeon with a blank space for your notes should you want build a new adventure from scratch. 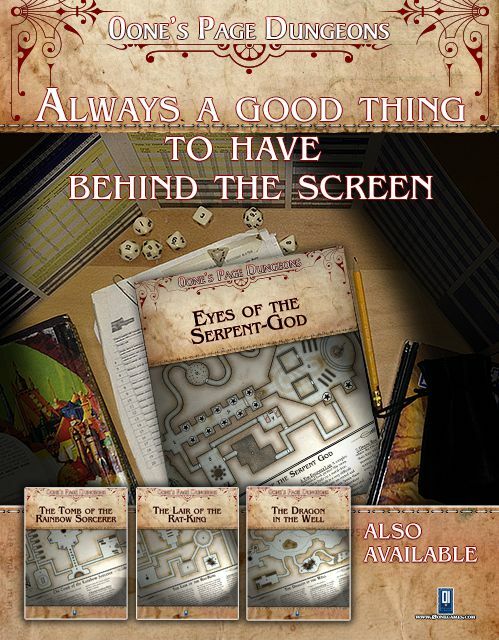 The dungeon description contains usually keyed locations plus three additional paragraphs, helping you to insert the adventure in your own campaign.